The Morland Writing Scholars 2018 have been announced today, Tuesday, November 27, 2018. The four are Edwige Renee Dro, Kola Tubosun, Sibabalwe Oscar Masinyana, and Siphiwe Gloria Ndlovu. 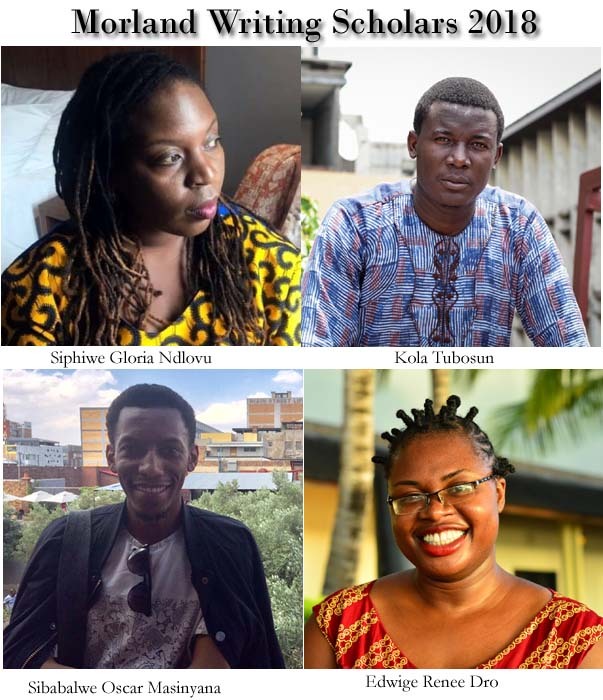 The Morland Writing Scholarship is an annual award given to African writers to enable them to work on a manuscript over a year without worrying about an income. Some of the previous recipients of the scholarship now in its fifth year include names like Elnathan John, Percy Zvomuya, Doreen Baingana, Abdul Adan, Noo Saro-Wiwa, Akwaeke Emezi, and Lidudumalingani Mgqombothi. Only four have produced work from their scholarship so far; Yewande Omotoso with The Woman Next Door, Karen Jennings with Travel With My Father, Simone Haysom with The Last Words of Rowan Du Preez and Tony Mochama with 2063 – Last Mile Bet. Edwige Renee Dro – Cote d’Ivoire. Sibabalwe Oscar Masinyana – South Africa. Siphiwe Gloria Ndlovu – Zimbabwe. The winners each receive a grant of ₤18,000 to allow them to take a year off to write a book. The awards are based on submissions which include a book proposal and an excerpt of published writing. Kola Tubosun will follow in the footsteps of a giant with “Soyinka in the Bush”, a genre-bending biography of the Nigerian Nobel laureate that will focus on Soyinka’s love of nature and his work in restoring natural habitats, all the while paying tribute to the great body of work Soyinka has gifted the world. Sibabalwe Oscar Masinyana’s novel “The House of the Apostate” will be an exploration of faith, identity and love set in South Africa. His proposal promises a literary novel of ambition and courage. Edwidge Renée Dro’s non-fiction book will bring to the world the extraordinary life of anti-colonial fighter Marie Sery Kore. In this book about a heroine with a complicated history, Dro will tell a pivotal point in the history of Cote D’Ivoire. Previous Previous post: Three Africans on Sheikh Zayed Book Award 2019 longlist. Next Next post: Wole Soyinka Prize for Literature 2018 shortlist announced.